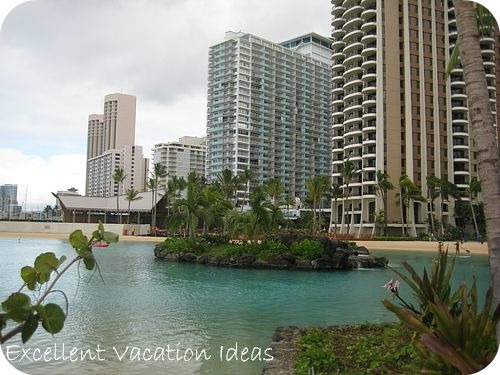 The Hilton Hawaiian Village Beach Resort, is located on Waikiki Beach in Honolulu, Hawaii. As it is the only true resort in Waikiki there are an abundance of beach and pool activities, and other amenities and activities for a great Hawaii vacation. 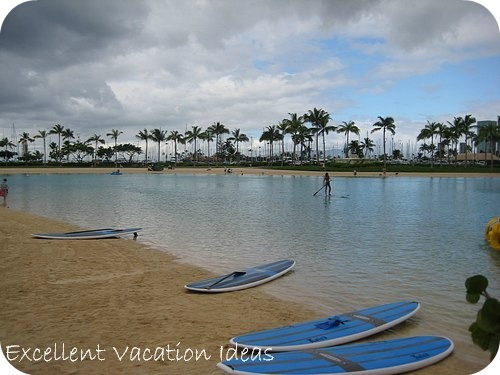 We recommend the Hilton Hawaiian Village for families as there are so many family based activities. If you are looking for romance, try Kauai or Maui. The Hilton Hawaiian Village Beach Resort is located on the widest stretch of Waikiki Beach, has 5 pools and a lagoon to choose from when it is time to cool off. This gives you lots of choice of water based activities: from sun worshipping, to beach combing, to snorkeling, to surfing, to pool lounging, to hanging out in an inner tube in the lagoon. Guests are provided pool and beach towels. Since the Hilton Hawaiian Village Beach Resort is on the widest stretch of Waikiki Beach, it is a great area to enjoy Waikiki Beach. It may not be as crowded as other parts of the the beach. Be forewarned though, it was quite rocky while we were there. You may want to make sure you have water shoes to enjoy it. If you are a guest at the hotel, you can rent beach chairs, umbrellas or other beach equipment at the Waikiki Beach Activities stand between 8:30 am and 6:00 pm every day - near the Hau Tree Bar. Make sure you get there early if the resort is busy as they may rent out by early in the morning. You will find that the beach area is more comfortable to lay on then the lagoon area as the sand is deeper. 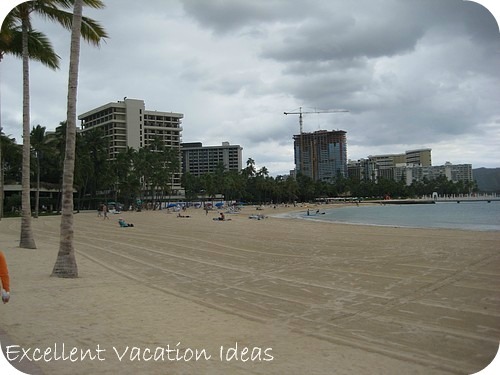 The part of Waikiki Beach that is in front of the Hilton is called Duke Kahanamoku Beach and was rated #3 for the best beach in America in 2011 by Dr. Beach - apparently he uses 50 criteria to determine which beaches are the best including sand quality, and safety. The Duke Kanahamoku Lagoon is a 5 acre salt water lagoon with it's own beach surrounding it. It is a GREAT place for kids as the water is calm and there is no under current like in the ocean. It seemed to be a little warmer than the ocean as well- but that was our experience. You can rent umbrellas, beach chairs, and inner tubes. You can also rent Paddle cats and Aqua Cycles. We did rent an aqua cycle for 1/2 an hour - it was a lot of work! I have walked to the foot of Diamond Head that morning too, so it felt like extra work for me! We paid about $23 for 1/2 and hour and the guy said that we could trade it in for a kayak or paddle boat if we wanted to as it wasn't very busy. You can also rent one-person and two-person kayaks. It is a nice peaceful way to enjoy the water. This is the best place to play in the water with the kids as it is calm and like a large pool or the Paradise Pool. There are so many dining options in this hotel complex, you wont' go hungry. From sushi, to a steakhouse, to seafood, to Starbucks to buffet and cafes, you will find something for everyone here.